This wiring kit is required for use with the Yamaha Adventure Pro™ powered by Magellan® (sold separately) on 2018 and earlier models. When out on the trails or exploring all-new areas this Yamaha Adventure Pro® powered by Magellan® will help you get the most out of your adventure! The Adventure Pro is the perfect companion and will help you share your trail experience with its front and rear cameras and social media/trail/vehicle logging. Further increase your confidence while exploring by being informed of what’s happening with your ride as the Adventure Pro integrates with your ride’s computer. BACKWARDS COMPATIBILITY: For installation on ’16~’18 YXZ1000R/SS models and ’18 Wolverine X4 models, accessory Adventure Pro™ Universal Wiring is required and sold separately (Yamaha Part Number B8K-H8107-V1-00). Provides basic data integration and full GPS function on these models. For installation on Viking models (all years) and Wolverine models (’18 and earlier), accessory Adventure Pro™ Universal Wiring is required and sold separately and provides GPS function only on these models. Getting Started - Let’s get started by doing a first-time set-up. Dashboard - The Adventure Pro Dashboard is one of the system’s many unique features. Journal - In Adventure Pro, the Journal is where your routes, locations and planned routes are stored. Navigation - Let’s take a look at the navigation abilities of Adventure Pro. Logging - Let’s take a look at logging new trails using Adventure Pro. 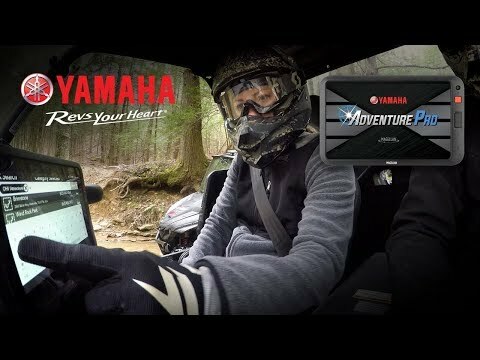 Social Media - In addition to utilizing the YamahaAdventurePro.com platform, the Adventure Pro system also ties in with your favorite social media channels. Timing Mode - Adventure Pro features Yamaha's exclusive timing mode to record courses and challenge them for the best possible lap times. Settings - The Adventure Pro offers a range of configurable options. Using the menu selection bar, tap the gear icon for Settings.